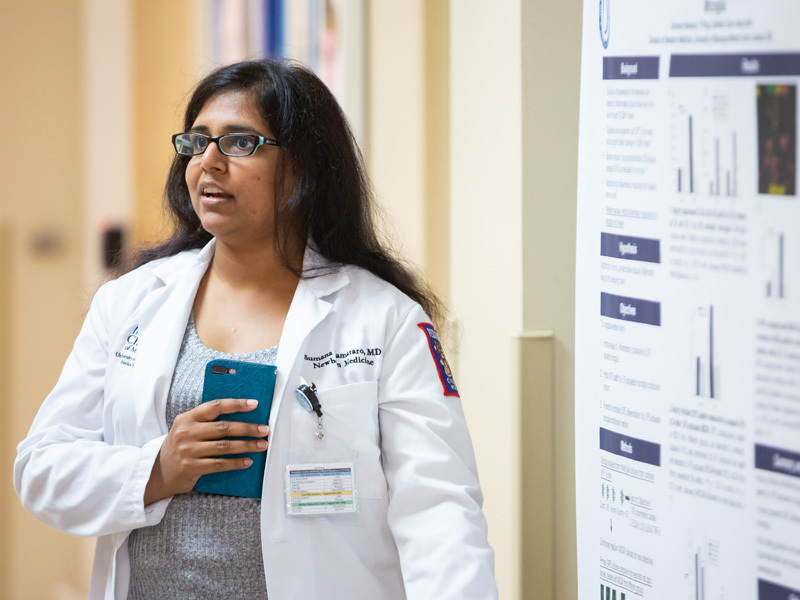 Dr. Sumana Ramarao helped pin up posters along the mural-covered hall leading to Children’s Hospital as part of the University of Mississippi Medical Center’s first Pediatric Research Day June 15. Each poster displayed the results of months, even years, of work that have the potential to one day change the care of children and babies. “Sumana, you’re the mother of good children!” Dr. Norma Ojeda, associate professor of neonatology, exclaimed over Ramarao’s participation in multiple research projects, including one that shows how a commonly used antibiotic, azithromycin, can reduce brain inflammation in low-weight newborns. Ramarao discusses how a common antibiotic can reduce brain swelling in low-weight newborns. That particular project involved 18 months of work during Ramarao’s three-year fellowship. She’ll be joining UMMC as a neonatologist in July. Held in an area of the Medical Center that’s a crossroads for medical professionals as well as patients and families, Pediatric Research Day is an effort to highlight research efforts to colleagues and the community, said organizer Lacy Malloch, research specialist in pediatrics and child development. “We wanted to show our research where families would be walking, so it will be seen by not only faculty and staff but also by the families we serve,” Malloch said. 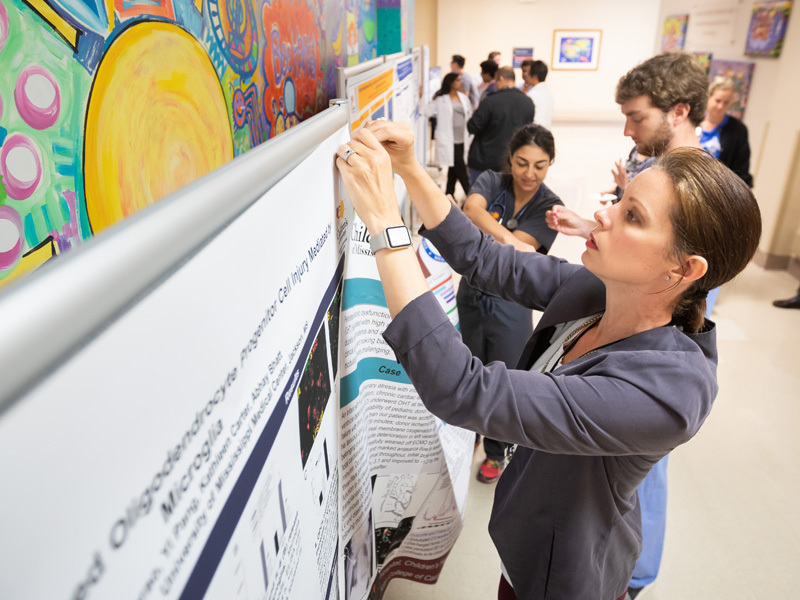 The research seen on posters Friday may go on to change patient care, said neonatology researcher Kathleen Carter, among those with study posters on display. “I’m really excited to see all our research in one place,” she said. Pediatric Research Day puts UMMC’s mission on display as well. Lacy Malloch, research specialist, helps hang posters in the hallway leading to Children’s Hospital. Displays included details of efforts to create a university-based pediatric clinical trials network, find best practices for care of infants exposed in utero to opioids, Vitamin D supplementation in children with obesity-related asthma, hypoxic ischemic brain injuries in newborns, intrauterine growth restriction, ventilation after surgery and ways to increase availability of breastmilk to babies in neonatal intensive care. Pediatric cardiology research projects included studies in managing acute rental failure following pediatric heart transplants and use of stents to treat vascular obstructions. That so many of the research projects focused on newborns was gratifying for Dr. Abhay Bhatt, professor and director of research in newborn medicine.